Bafana Bafana failed to qualify for the 2012 AFCON in a most embarrassing way, because they celebrated thinking we've gone through only to re-read the rules with four eyes. Then minors in our 2014 World cup qualifying group, first a dull home draw with Ethiopia. Can you tell me one player from Ethiopia? And then SAFA decided, it’s time to sing our song another one bites the dust. Pitso Mosimane’s reigns as national soccer team coach is over. SAFA decided to release him following a string of poor results. But I was left with a cluster of questions un-answered, why did we groom him under Parreira for such long time? Only to fire him halfway through? How many have we fired? Where is the problem, SAFA or Bafana coaches, or even players? Have we done enough as a country to build our football team?-what have we done? Referring to the Sunday game, how many of our players that played with their heart out? Except Sundowns duo-Modise and Masenamela, not even Pienaar. Yes the coach did field matchless fit players Bongani Khumalo and Katlego Mphela, but what other 9 players did? So clearly we can’t point all fingers to Pitso, no way. What are other assistance coaches doing? SAFA roped in Steve Khompela to assist him, but he only sat on the bench for just 1 game and the next thing coach is gone. Is it fair to Pitso? Why didn't we give the pair some time and see their true colours together? I’m not defending him but the problem is not with him, but SAFA should give us answers. How many South African junior teams that have won a trophy in the last decade? None, so how can we expect Bafana to be magical without development? After 2010 all sort of promises were made for developments, even Pereira himself advised us, what SAFA has done up to now? Nothing. No proper reserve league in place, even our players go to Europe only come back failing. Some of our clubs don’t want release our players to go to Europe and bet themselves against the best-Chiefs and Sundowns refused to release Khune, Thsabalala and Mphela respectively. So where is the problem? SAFA or Bafana coaches? SAFA only cares about hosting tournaments, than investing in our team developments. 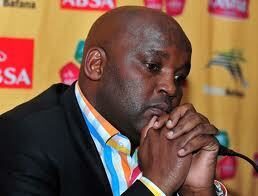 Pitso took SA inside top 30 at one stage-potential is there but supports is what lacking. I’m not defending the man, but fact should remain facts. Yes Pitso you did drop the ball, by leaving red hot Benni McCarthy, Mathebula etc. Egos did cost you, even when Rodgers withdraws, still you couldn’t call Benni. Even Joseph’s retirements you could’ve handled it better, you lost a character in your change room. Why fielding Khumalo and Mphela ahead of full match fit players? Only you can answer that one, yes big man-you did let yourself down too with you questionable decisions. So who is next? Surely this time, it should be Gordon Igesund, if not-then we hire to fire.